"A meal in itself. 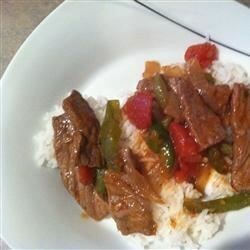 A spicy beef and bell pepper combo served over a bed of rice. This recipe is an instant favorite and economical, too." Trim any fat from round steak and slice meat into thin 2 to 3 inch long strips. Remove the seeds and core from the green bell pepper, and slice into thin 3 inch long strips. In a large frying pan over medium to high heat add oil and cook meat until medium rare, add peppers and continue cooking until meat is browned. Reduce heat to simmer and add tomatoes, soy sauce, garlic powder, black pepper and ginger. Cover and simmer 10 minutes. Dissolve bullion cube and corn starch in 2 cups water and stir well before adding to simmering beef. Cover and simmer 10 minutes, stirring occasionally, until sauce resembles the consistency of gravy. Remove from heat and serve over a bed of rice. To cook rice: In a saucepan, bring 2 cups of water to a boil. Stir in 1 cup of rice. Cover and reduce heat to a simmer. Simmer for 20 minutes. Create a family favorite tonight! Why do people give recipes 4 stars when they change the recipe, if you change the recipe then it is your own fault if it doesn't turn out!! Good recipe!! A bit on the soupy side but very flavorful. I added red pepper as well as the green pepper. I will make this again, cutting back on the water next time. Really really good!! I chop up my own tomato(s) instead of canned... and i add at the last 5-10 min so they dont get soggy. I have not had pepper steak and rice in over 10 years and I was pleasantly surprise that it taste almost as good as my grandmothers! My husband LOVED IT. Not bad. A little on the bland side though. It felt like it was missing something. Maybe fresh garlic next time?